I’ve been not working for a month now and time passes really slow. I don’t know if I enjoy it as much as how I thought I would. I’ve been thinking much about the past mostly on work. It may seem great for others to see I’m doing what I enjoy, what my passion is. But I’ve somehow come to a point where, I don’t want to mix passion with work. Keeping them apart gives me option to at least have something to look forward to.. If I don’t like my job, hey I still have cake. But if job = cake and I hate job means I hate cake too, which is not what I really want to happen because if u loose it, then u loose everything. 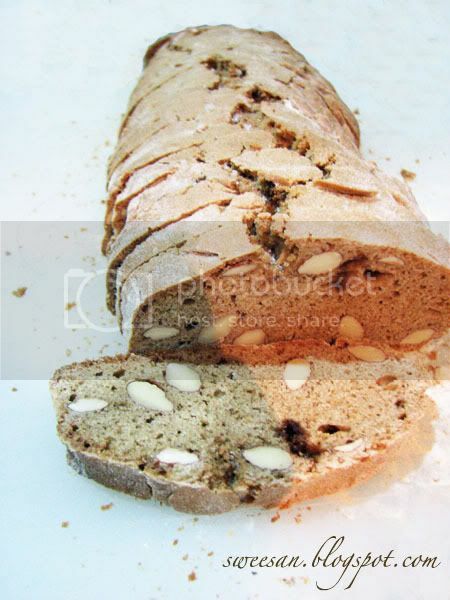 Biscotti are very versatile in terms of flavour. 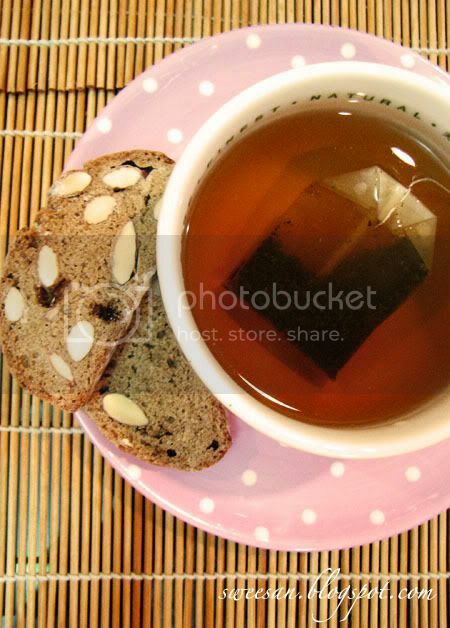 Nuts and dried fruits works tremendously well here to create a nutty and earthy flavour. Spices are often added in to give in the extra kick. 1. Preheat oven to 175 C. Sift flour, baking soda and salt in a bowl. Set aside. 2. Whisk eggs, vanilla essence, and both sugar in a mixing bowl till creamy. 3. Gradually fold in flour till it comes to a dough. Dough will be sticky it’s okay. Don’t overmix. Add in almonds and fold to incorporate thoroughly. 4. Scoop dough out to a surface dusted with flour. Form dough into a long log shape. If it’s too long, split to 2 logs. 5. Bake at 35-40 minutes. Remove from oven and let it cool for 10 minutes. It is important you let it cool before cutting it otherwise you don’t get the clean cut. 6. Use a serrated knife, cut pieces about 1cm thick, or depending on you. The thicker it is, the longer it takes and vice. 7. 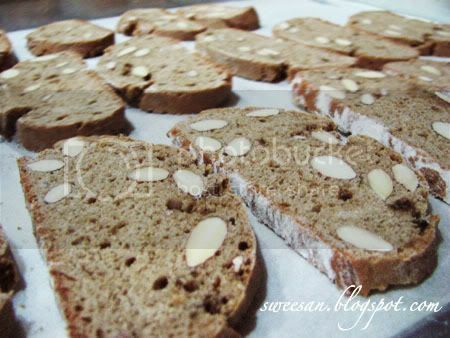 Place cut biscotti one side up and bake for 10 minutes. Turn over the other side and bake for another 10 minutes. 8. Remove from oven and keep in airtight container once cooled. Cut into slices and arrange them on a baking tray. Ready for baking! Simonne : Yeah I cool it down for a little while, about 10-20 minutes. If you want to cut thinner slices then you can put in the fridge.. 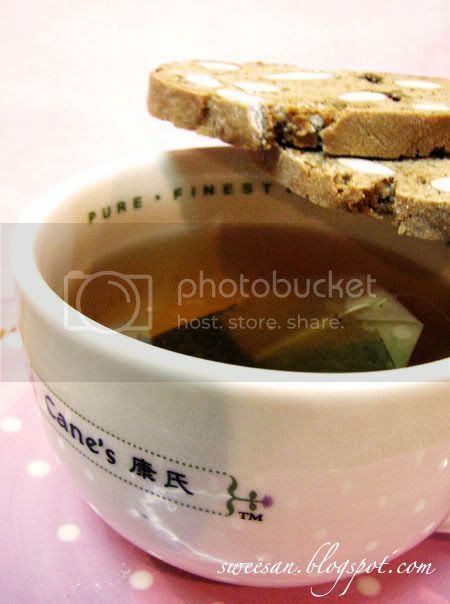 This is a little cake-y compared to the chinese style of biscotti..